Already a staple on East London’s eating scene, Urban Food Fest has not only received praise from high-flyers the likes of Esquire, the New York Times and Shortlist, we like to think we know a little something about everything here at DMN, so we’re here to give it a pat on the back too. A siren’s call of food tents, craft beer and independent food purveyors that craft dishes as well Leonardo Da Vinci did just about anything, Manchester gets a slice of this must-try pie in 2015 as Urban Food Fest comes calling from February 28th 2015. Taking to the Euro Car Parks once Valentine’s Day has had it’s wicked way with those in love, and those wickedly lonely, Urban Food Fest will bring about a menagerie of meals for the city to try. 15 different food trucks, a cocktail bar and live music make up the haul of hearty plates this February as dishes the likes of ‘Mexican BBQ beef & hot sauce burritos, Middle Eastern falafel wraps, Spanish chorizo & chicken paella, chipotle chilli venison & slaw, tofu hot dogs with jalapeños & melted red cheese, Peruvian choripán with chimichurri’ will leave tongues wagging, while the length of that sentence probably wont. Coming heavily prepped with unique ales, craft beers and a cheeky pint o’ prosecco if your gut will allow it, dishing it out with chums on a bench in a car park has never sounded so damned delicious. At least not since Tamagotchi’s were still in that is. 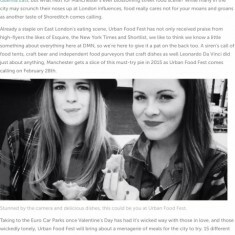 Another great event that ever tucks into Manchester’s brilliant food scene.